As you are getting started with your gardening areas, you'll want to buy potted flowering plants rather than trying to grow them from seeds. By purchasing potted flowers and plants, you'll have a good idea of what the plant looks like and quite possibly what color the flower is before you ever plant it in the ground. Be sure to purchase strong healthy plants that are free of brown leaves or withered flowers. The flowers should stand up straight and have beautiful green stems and leaves. There should be no weed growth on the soil surface in the pot or visible garden pests such as slugs or aphids. Always buy from a reputable grower whether online or in person. A reputable grower will be happy to exchange or replace a plant if it is unproductive. Also, for each plant you purchase, buy at least a 10# bag of good nutrient rich soil. A peat and humus mix is best. At the time you are digging the hole to transfer your plant from its pot to your garden, you'll surround it with this good nutrient rich soil to help the plant grow and mature early on. The third year they leap. 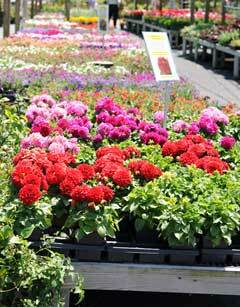 Purchase your potted flowers and plants in groups of uneven numbers (3 or 5) to put in your garden areas. The reason for uneven numbers in flower garden designs is that it looks more natural and avoids symmetry. Although the plants may be small the first year, planting in groups will produce a good initial effect when starting your gardening site. Next year you'll see a much fuller display as the plants continue to mature and grow.